The ExoMars Trace Gas Orbiter is set to analyse the martian atmosphere, in particular trace gases like methane. Although making up a very small amount of the overall atmospheric inventory, methane in particular holds key clues to the planet's current state of activity. Methane can also be generated by reactions between water and olivine-rich rocks, perhaps in combination with warmer, volcanic environments. Again, this could be stored underground in icy cages, and outgassed through cracks in the surface – or in the past through volcanoes. Methane can also be quickly distributed around the planet by strong winds, 'diluting' its signal and making it challenging to identify individual sources. 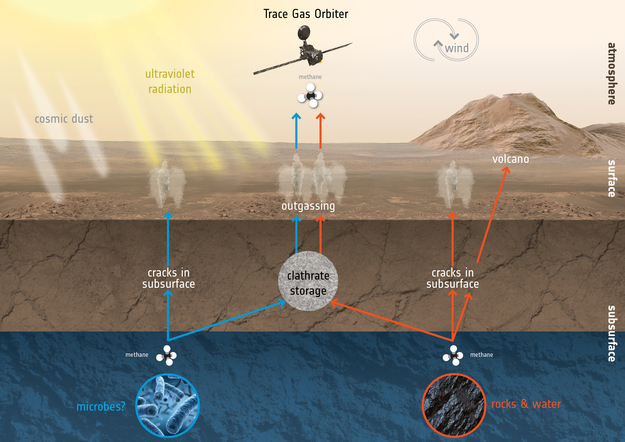 The spacecraft has the capability to detect and analyse methane and other trace gases, even in low concentrations, with an improved accuracy of three orders of magnitude compared to previous measurements. Furthermore, it will be able to detect key 'isotopologues' of methane and water (isotopologues are molecules that have at least one atom with a different number of neutrons than the parent chemical species) to help distinguish between the different formation scenarios.